LONDON–(BUSINESS WIRE)–Virtual reality is poised to create a huge market for enterprises and consumers by 2020, reaching over USD 100 billion as per the ongoing US FiO+LS 2018 conference. The use of specialized sensors, software, and 3D sounds enables vendors to offer an immersive VR experience. VR technology is becoming inexpensive, which is leading to its increased adoption among consumers. The technology is being used for many innovative purposes to achieve virtual communication across several end-user industries such as gaming, education, entertainment, retail, sports, and healthcare. 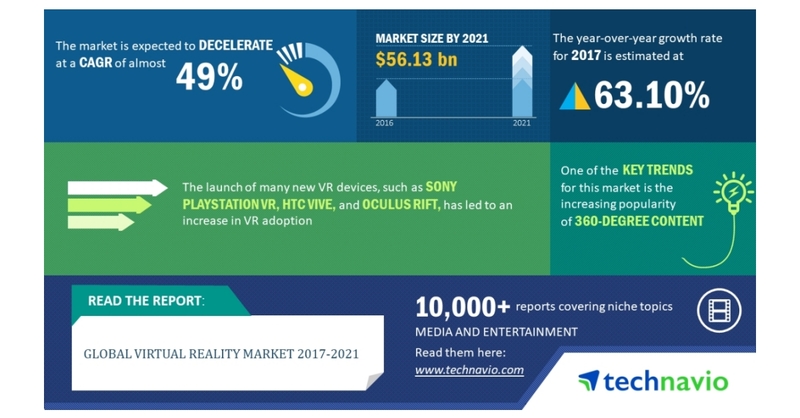 Market research firm Technavio has projected the global virtual reality market to register a CAGR of close to 49% through 2021. However, the growth momentum of the market is expected to decelerate due to a decline in the year-over-year growth. The launch of many new VR devices, such as Sony PlayStation VR, HTC VIVE, and Oculus Rift, has led to an increase in VR adoption. Heavy investments in VR technology and the decrease in the price of VR hardware are factors that will further boost market growth over the coming years.